I recently visited Vancouver for the first time on a business trip and I was shocked at how green the city was in the middle of February! Back home in Toronto the trees are bare and everything looks grey, but in Vancouver not only are the trees full of leaves but there was even grass! I soon realized that one of the reasons that it is so green is there is so much rain in the winter. While it rained most days during my week there, I was lucky to have two full days of sunshine to explore the city. If you’re headed to Vancouver, regardless of the season, here are a few things I would recommend to do based on my personal experience. No trip to Vancouver would be complete with out a visit to the 400 hectare green space that would make Toronto’s High Park envious. If you’re looking for some exercise, the park has numerous walking paths including my favorite, The Sea Wall, a 22 km stretch along the ocean with views of mountains and Vancouver’s skyline. You will be snapping away on your camera, as there are many photographic sights within the park including the iconic aboriginal Brockton Point’s totem poles which are carved from real trees and painted beautiful bright colours. If you are driving through Stanley Park, remember that most of the roads are one way, so if you see something interesting make sure you stop right away, otherwise you will have to drive around the entire loop to get back! Admission to the park is free, but parking cost $2 per hour, $3 in peak season. The Vancouver Aquarium is a cozy place to experience the underwater world, and a great activity to save for a rainy day. Even if you have been to aquarium before, it is still worth while to check out because of the different range of species, including a great display of local marine life. To avoid waiting in ticket lines, patrons are encouraged to purchase their tickets online. Adult tickets are $21 during the off season. 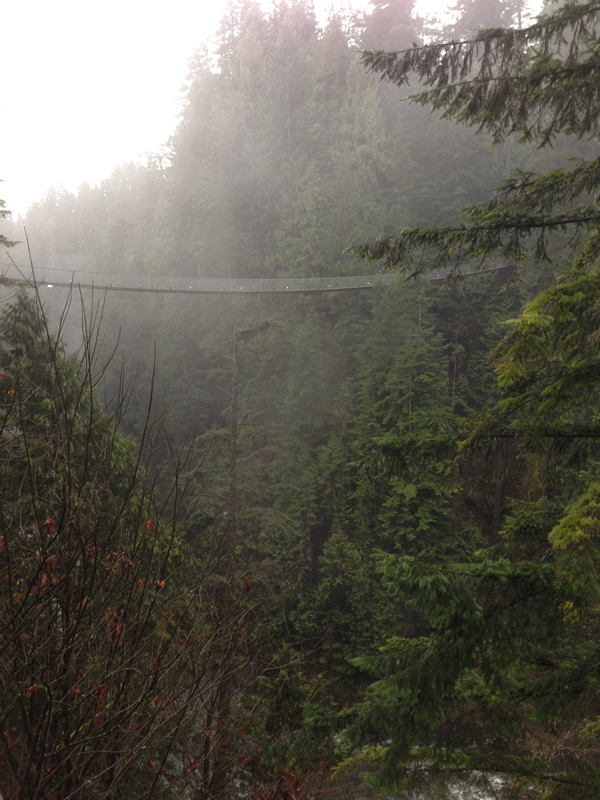 3) Walk across the Capilano Suspension Bridge. While While Capilano may have a touristy feel, there is no mistaking the magical feeling you get while surrounded by the massive, old Douglas fir trees that fill the park. There are many ways to explore the rain forest while you are in the park. 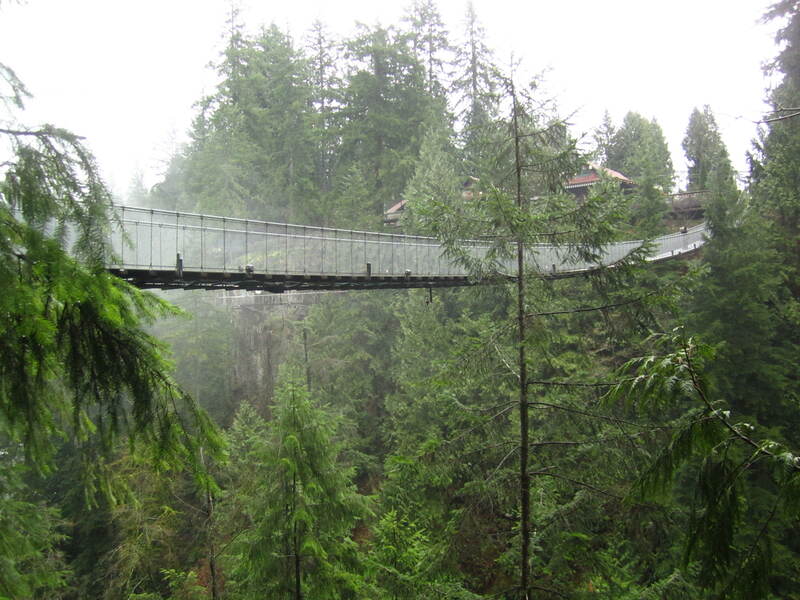 Start by facing your fear of heights by walking across the 240 foot high suspension bridge over the Capilano River gorge. Once you are on the other side, take the Tree Top Adventure, a series of suspended bridges that take you through the canopy of the rain forest. Finish your day by daring the Cliff Walk, a very narrow suspended walkway that juts out from the cliff wall. Everything is included with admission. It is not cheap at $31.95 per adult, but if your not strapped for cash, its a fun place to spend an hour exploring. Granville Island is full of cute boutiques shops and restaurants but the main attraction is the Public Market. 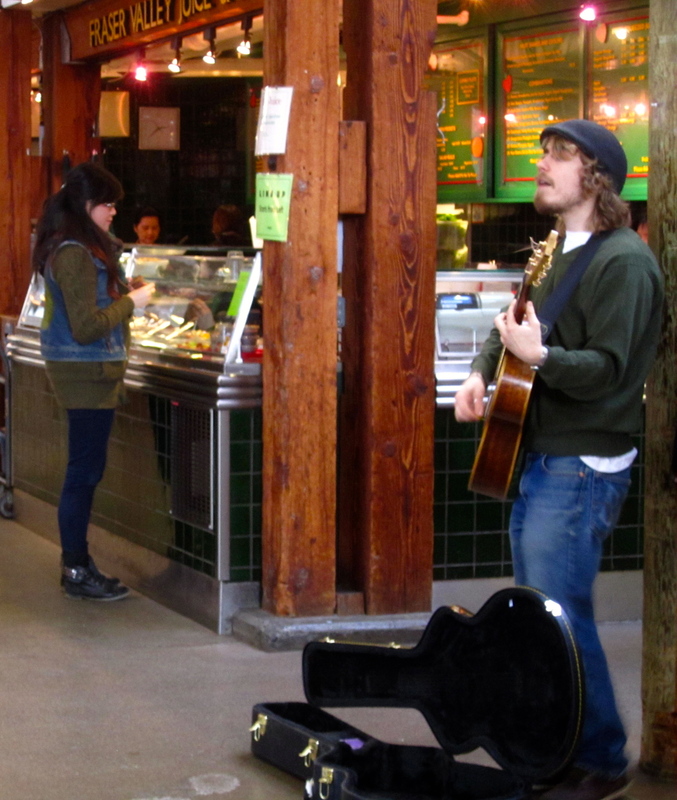 The Public Market is mainly indoors, so it could also be a good option for a rainy day. The Market is full of produce, meats, cheese, flowers, chocolates and trinkets to buy (what more could you want in life.) There are many food stalls offering prepared food, so it is the perfect place to grab lunch and listen to the multiple musical buskers. I enjoyed a fresh and yummy lentil salad! You can either drive, or take a ferry to the island, Just be warned that if you are using a GPS, it may not know the way! 6) Drive the Sea to Sky Highway to Squamish. Also known as Highway 99, the Sea to Sky Highway is a scenic north/south route along the coast of British Columbia with views of the sea, mountains and of course the sky. This highway can take you from Vancouver to Squamish, and even to Whistler and beyond. Squamish is a very pretty region that offers some great fly fishing and hiking opportunities. On the way I just had to stop at Shannon Falls Provincial Park to get a pic of the sign. From the base of the Falls, you can find the Stawamus Chief trail head, an 11 km hike with an elevation change of 600 meters. Unfortunately since it was winter I only made it about 2/3 of the way up when I had to turn around because of ice. Apparently there are some good views at the top, but I will just have to wait until I visit in the summer to see them. Kingyo Sushi – Not only was the sushi amazingly delicious and fresh, but the service was great and I made friends with my waitress. I recommend trying the mackerel! La Bodega – I found this one in a Lonely Planet guide. La Bodega is a cozy Spanish Tapas restaurant downtown. It had a very friendly atmosphere and seemed to be filled of locals chatting away with the staff. The food was good too, but it can be a bit pricey if you want to order a lot of food. 1) Hike The Grind trail up Grousse Mountain. Unfortunately this trail was closed for the winter season. 2) Go for dessert at La Casa Gelato, where there are 508 flavours of Gelato to choose from! When it comes to picking something form a menu, I am very indecisive so I will have to leave extra time for this one.